Instaflex Vegetarian features 4 key health ingredients to help support and comfort joints. 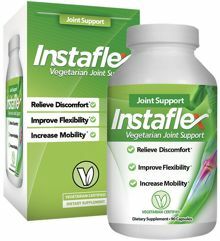 Instaflex Vegetarian contains Regenasure glucosamine, the only vegetarian source of glucosamine made in the USA. Instaflex goes to work fast, providing, maximum relief that vegetarians and those with shellfish allergies can count on.